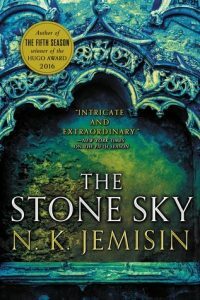 The third and final installment in N. K. Jemisin’s The Broken Earth trilogy, The Stone Sky, continues to deliver. (The first two books are The Fifth Season and The Obelisk Gate.) It has everything anyone would want from a strong fantasy story — climactic battles, death-defying acts of bravery, and heart-tugging moments between characters. But, it is done in a way and in a world that is both unique and goes the extra step to pull you in, to make you care for these characters. Jemisin’s world is so unique and so well developed, but even more importantly, her characters are deep. Characters that I hated in the first two books because they seemed so evil are given their own voice and own perspective. In the end, you realize that they aren’t evil but that their motivations are so against the protagonist that they seem evil. When they suffer, you feel for them. And, this is probably the thing I’ve liked most about her books. Her worlds are grey. They are nuanced. There is no absolute evil, there is no absolute good. Good characters do bad things and bad characters do good things. Even the overarching conflict that drives the plot is about survival, of both sides. One side isn’t trying to conquer the world just because, but rather, both sides are fighting to exist, in some sense. It’s just that the fight ends up taking place on a planetary scale. The other big issue she tackles is the environment and people’s impact on it. It turns out that the horrible state that the current people find their world in is the direct consequence of a previous civilization’s attempt to extract energy from the planet. In some sense, the planet rebelled. The broad theme of Jemisin’s book is subjugation and what happens when the subjugated, whether it be people or the planet, rebel. Whether it is an individual, a class of people, a whole civilization, or even an entire planet, at some point, things break, people can’t take any more, the environment shatters. What are the consequences when society or culture is built upon subjugation? “Some worlds are built on a fault line of pain, held up by nightmares. Don’t lament when those worlds fall.” There are lessons for all of us in The Broken Earth. This is one of the best fantasy trilogies I have read, with characters that are meaningful, plots that engage, a story that is relevant, and a world that is nuanced and complex. I give it 5 stars. An aside that I found interesting. Jemisin has a group of characters — called the stone eaters — that can communicate with each other through subtle tremors in the earth. They create microscopic earthquakes that they use to talk to one another. It is interesting how this is similar to the communications that the mechanical characters use in Ian Tregillis’ The Mechanical. The robotic characters there communicate via subtle changes in the motion of their gears and springs. In both worlds, these are the subjugated beings and they both find secret ways to communicate. An interesting coincidence.